Melt the chocolate in a double boiler on the stove or in a heat-proof bowl on the defrost setting in the microwave. When the chocolate is melted, add the coconut oil and mix well. 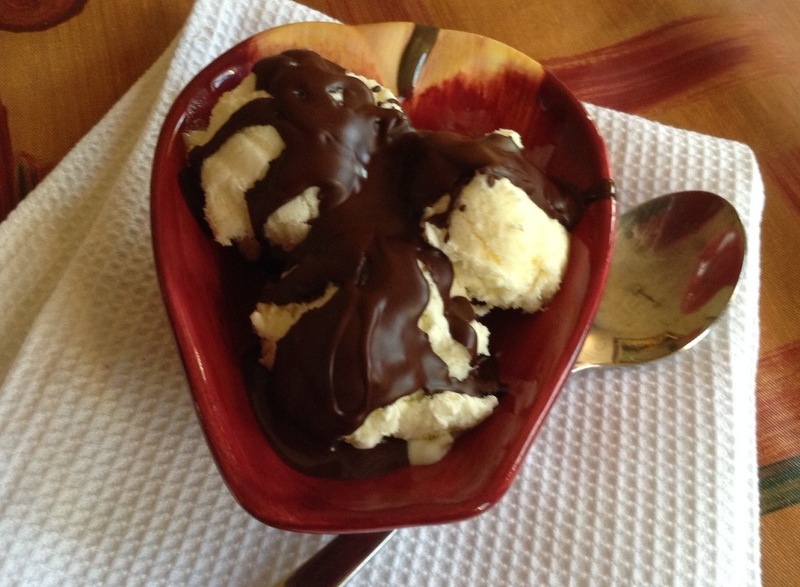 To serve, spoon ice-cream into dessert bowls or into ice-cream cones and drizzle the chocolate sauce on top. The chocolate will harden almost instantaneously! – Leftover chocolate can be stored in an airtight container in the fridge. – Leftover chocolate can be reheated and used as a sauce, but it will lose some of its hardening properties. – Coconut oil is available from health shops, pharmacies and fruit & veg shops. See my post Nuts About Coconuts for more info. This decadent recipe has been taken from Di Burger’s book “Chocolate’s African Odyssey”. Read more about the latter and her book Celebrating Méthode Cap Classique here. Butter the sides of a rectangular ovenproof dish. Place the 150g chocolate, whipping cream, rum, sugar, butter and cinnamon in a bowl and melt on medium in the microwave, stirring every 30 seconds until melted. In a separate bowl, whisk the eggs and then whisk in the chocolate mixture until it is smooth. Spoon about 1 cm layer of the chocolate mixture into the base of the dish and arrange half the croissants over the chocolate in overlapping rows. Sprinkle the chocolate pieces over this. Pour half of the remaining chocolate mixture all over the croissants as evenly as possible, then arrange the rest of the slices over that, finishing off with a layer of chocolate. Use a fork to press the croissant gently down so that it gets covered very evenly with the liquid as it cools. Cover the dish with cling film and allow to stand at room temperature for 2 hours before transferring to the fridge for 8 hours or overnight. When you’re ready to bake the pudding, pre-heat the oven to 180°C. Remove the cling film and bake in the oven on a high shelf for 30 to 35 minutes, or until the top is crunchy and the inside soft and squidgy. Remove the dish from the oven and set it aside for 10 minutes. 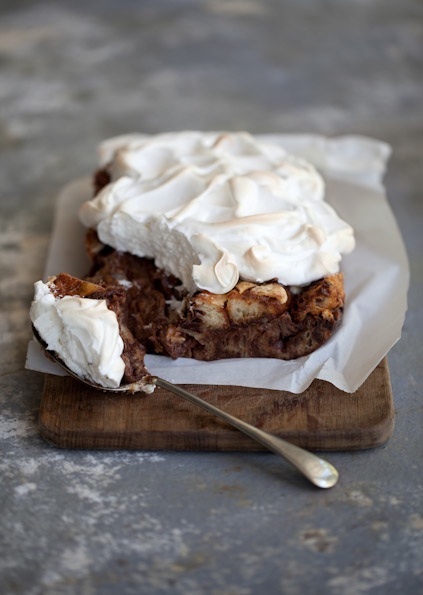 Turn the oven down to 160º C.
Make meringue with the egg whites and castor sugar and spread gently over the pudding. Bake for about 15 to 20 minutes or until the meringue is set and just starting to colour. These delicate sponge puddings has been developed for a steamer, but can be baked in the oven at 180 º C for about 20 minutes. In a medium mixing bowl, cream together the butter and sugar with an electric hand mixer until smooth. Combine the egg and milk in a measuring jug and add to the butter mixture while beating. Add the flour and lemon zest and fold in gently with a spatula. Grease two 200 ml ramekins with butter on the bottom and sides. Divide the biscuit crumbs evenly between the two ramekins. Tap the ramekins against the palm of your hand in order to distribute the crumbs all over the inside of the ramekin. 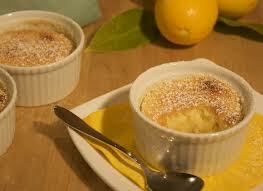 Divide the jam, syrup or honey between the two ramekins and spread it evenly on the bottom of each ramekin. Divide the batter between the two ramekins. Place the ramekins in the Steamer and steam for about 15 minutes. When the timer rings, remove the ramekins from the steamer with protective gloves. Serve hot, at room temperature or cold with custard, cream or ice-cream.